How do I keep the water from gathering on my lens port, I do not want to just start trying stuff, being afraid of ruining the housing. I seem to ket water droplets right in the wrong places.... Any suggestions??? spittin's the trick for sure. I have tried a tea-tree oil based, clear, low suds, biodegradable shampoo which works too,; but spit is cheaper, easier to carry, and you never forget it. One huge difference I've noticed between underwater and surf housings -- with underwater housings, we use ports that have flanges that come up past the actual dome or flat port. You can put a housing down with its dome port or flat port facing down, and the flange will protect the port from being scratched. Not so with surf housings, and this is because the flanges are the cause of water droplets. With surf housings, the port has nothing around it. It comes up and is on its own. This is good, because water just sheets off the port (as long as there is "quality" spit on it). I've used various compounds for over/under shots to have water droplets sheet off ports. Dried spit works well, but the spit must be "quality". By that, I mean this: you cannot have eaten anything recently. The spit has to be pretty clear. You have to let it dry on the port first. After that, it forms a very thin shield against water droplets. Folks have tried using stuff like RainX and Turtle Wax. None of this stuff works and may actually damage acrylic or Lexar ports. The only thing I have found that works is mask defogger called Spectramar Beris that was marketed by ScubaPro years and years ago. This stuff works well, but is almost impossible to find. Its primary ingredient is ethylene glycol, and I've been tempted to just get some ethylene glycol and try it out sometime. But I still have a couple of bottles of Spectramar Beris after 25 years of underwater shooting. Here's my spit technique **for surf housings**, it works perfectly. I rarely get water drops in my shots. 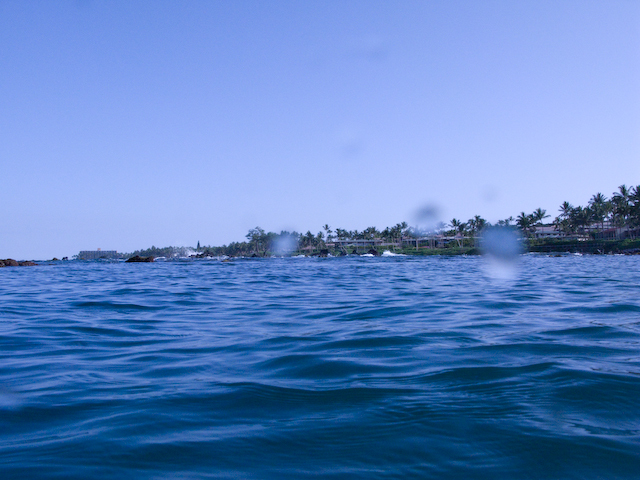 For wide shots (in the impact zone): about 5 seconds before the wave is on me, I spit on the port. I might **gently** spread it around with my finger (no rough gloves). I dip it, pull it out and now I have a perfect thin sheet of water on the dome, it is effectively part of the optics. It will remain intact for about 10 seconds or so, throughout the entire sequence until I am underwater again. The key is keeping that thin sheet of water intact. After a while -- especially if it is windy -- it tears apart and you have the classic "water droplet on dome port" problem. Using just plain sea water doesn't work nearly as well, it is the spit then the quick rinse that creates the thin sheet. Eating fries was recommended to me, something about the sugars in your saliva having a beneficial effect on the surface tension and holding that thin sheet on the dome intact. So I make sure to down a supersize box of fries before every session. For telephoto shots with a 70-200 through a flat port, I carry a tiny squeegee on a necklace. I will first lick the squeegee to get any salt and sand off it the blad, then spit on the port, rinse it, and then **gently** squeegee it with a tiny squeegee. If there is any streaking, I repeat the process. Once I have the flat port streak free and dry, I keep the port dry as long as possible by floating the housing in the water with the port pointed up in the air (not toward the sun), which is not hard to do if you are outside the impact zone on in a channel. Once it gets spots from spray or some grom buzzing me, or it gets dunked, I will spit, rinse and squeegee again. Two techniques depending on whether in the surf or shooting from a channel. I don't have any experience with waxes or applying anything other than spit to the ports. Edited by Phil Colla, 10 March 2008 - 07:53 PM. Hey thanks for this thread guys. A couple of thing i learned - take off the guard from my 8" dome and spit on the dome. Hope to test some of this out this weekend. The spit technique worked a treat. Thanks so much. Hope to post some images soon! Edited by Stephen Colquitt, 27 April 2008 - 06:35 PM. Actually I get lots of flem build up. Recently I've been bottling it all up and it goes on sale at a greatly reduced price to wetpixel members too! I'm also now looking into drying it out and making a special rub on compound too! Anyone interested? Edited by Marjo, 03 June 2008 - 06:59 AM. Just don't get so carried away with the spitting/licking that you forget the wave that's about to crash over your head. I know it's happened to me . Why the heck didn't I think of that before? It's so obvious, in retrospect. Good looking shot Hani. Loving the camera and getting used to it being slow(er). This a pretty cool site.....is there a way to post pics without having to do a direct web link? Edited by freesurfpics.net, 21 September 2009 - 08:05 AM. You can attach photos to your posts. Just click underneath where it says "attachment editor" or something like that. You have to use "Add Reply" or click on More Options below Fast Reply to get the attachment editor. Thanks James, they hid that pretty good. Here is one of G10 shots.